I absolutely adore fairy tale re-tellings. Marissa Meyer has a unique way of twisting the story and captivating us. Scarlet is based on Little Red Riding Hood; where the grandmother goes missing and the wolf is after her. I really enjoyed the take on this story. It's like I didn't know what to expect. I felt like I was going on an adventure with the characters Cinder and Scarlet. With Cinder we are discovering more about her, and with Scarlet we are trying to find the grandmother, and why she is being held captive. Along the way we meet various new characters (even some returning). Scarlet is very brave. She can fly ships, deals with living on a farm and is a determined person. She is very independent, and that is why I like her. Wolf is a mysterious character with a few anger issues. Even though we have our doubts about him, he turns out to be a great character who develops a great bond with Scarlet. If you know the story of Little Red Riding Hood then you'll understand why we have our suspicions on his type of character. Cinder...oh my God! I'm so glad she returned as I loved her in Cinder. She is such an awesome cyborg. There is something we find out about her in this book, and I was literally like "Yay!" because knowing this now makes the story SO much better! We don't get to see a lot of Prince Kai in this book, which is slightly disappointing as I do love him so. Hopefully we get to see so much more of him in Cress. Queen Levana is just so evil and controlling that she makes my skin crawl. I just want to reach inside and strangle her! The general storyline is very enjoyable. The chapters aren't too long and it's written in second person. The beginning had a great start as it was straight to the point, and that had me hooked. The ending leaves me wanting to read the sequel. 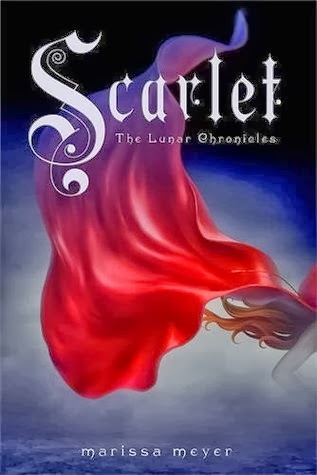 I like how the book is structured; going from what's happening with Cinder, to what's happening with Prince Kai, to Scarlet. That way we get to see all that's going on with those characters. I found there was a lot more going on in this book, but I think I loved this just as much as Cinder, and that is why I gave it five stars. Well deserved. If you like fairytale re-tellings with powerful characters, then this is definitely for you. I honestly can't wait to read Cress!